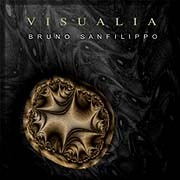 On the album Visualia (59'39"), Bruno Sanfilippo shows us that Ambient Music can offer the listener more than just the pleasant passing of time. Working in a genre steeped in neutrality, Sanfilippo has realized a distinctive work at the upper edge of attention yet unbound in time. Visualia exists as a series of nine tracks - moments of sensation which the listener links together to construct a cohesive, however dreamy, mindscape. The album drifts along gradually between frames. His pieces are in constant motion, wandering amongst dark and light tones and moods. Low synth pads purr deeply beneath gently plucked metal strings while intriguing samples and field recordings tease the analytical side of our senses. Reverberant voices sing as layers of synth patches build alongside mad ethnic drumming. Out of a windswept dream rises an evocative piano solo, ever so bright against the dense drone. Themes are repeated and rephrased just as an old memory is revisited and again considered. 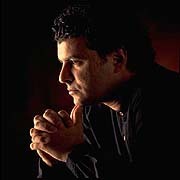 Behind the experience is the composer's intelligent, human design. Visualia roams and strays like a dreaming mind. The territory covered is dramatic and beautiful. With its majestic harmonies and heavenly voices, this album explores the more elegant side of Electronic Music.